Confession time. I am drawn to red hot and wicked foods! I devour devils. Oh yes, I do. Red hot devils. Lots of them. They’re hot and sinful…but ever so delicious. Thankfully, my uncles and cousins from the US bring generous amounts to satisfy my appetite. If that wasn’t enough, I eat this too. 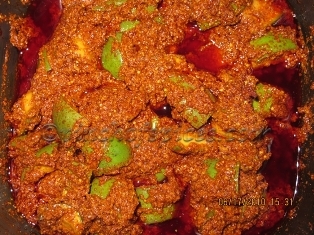 Red hot avakai pickle from Andhra Pradesh. No one does mango pickle quite as exquisitely as the Andhras. 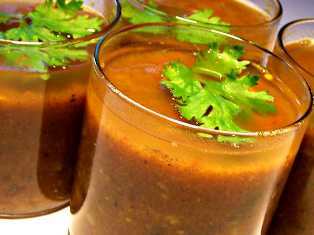 Rasam – red hot – a kind of soup made of pepper! Home made and potent. Enough to clear your sinuses for a week!! I like my food hot and wicked. Do you? This is my contribution to Monster Mash for BlogFEST2012 . Today’s host is Daphne of A Full Degree Below Normal. Corinne, don’t even get me started. Like you, even I enjoy spicy food and my mom makes wonderful spicy food which never fails to satiate my taste-buds. And, if my nose and eyes become all teary because of the food, then the food has made my day. An afterthought: Perhaps because of this taste for red, hot and spicy food, my personality is also like that – red, hot and wicked 😉 How about you, dear Corinne? 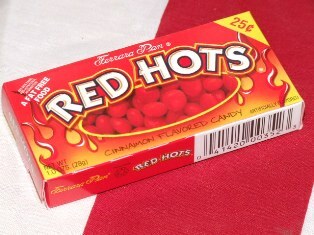 that brought back some memories but now over the years living in NZ I’ve lost my taste for the hot and spicy. I especially like my grandma’s curries, because it adds a lot of spice and chilly into the curries (I personally like it, but others in my extended family doesn’t). Sight of that avakkai is making me drool!! 🙂 Agreed, Andhraites make it best! I’ve got a bottle here for each time I look at this picture, Jaish! 😉 What’s your pickle of choice and where do you source it from? That pickle – ohhhh I so miss Andhra avakaya.. and your picture is not helping a bit either, madam. You are guilty of making me homesick. I love the way we consider ourselves Andhra girls, Punam. No one would ever guess – except when they see our food choices! I regularly get parcels of avakai from the Swagruha stores via my family. I’m sure you’ll get some in your part of the world too. Andhra girls- I am kind of loving that tag ! My brow broke out in a sweat just looking at the pictures! Though I never inherited that taste from him as I love my food very mildly spiced..but the pictures are damn yummmm… will show it to my Dad. M sure he will love it! Well if you promise me a never ending supply of such wonderful posts – I can promise you a year long supply of avakai till eternity!! It is a summer ritual at my house. My mother, aunts, grandmother everyone comes together to make almost some 25 kgs of it and maggai which is then sent to our relatives :)Kind of some secret recipe I guess!! I love them all….spicy ones…but, should be mild on garlic. I love garlic in pickles and in other food too! 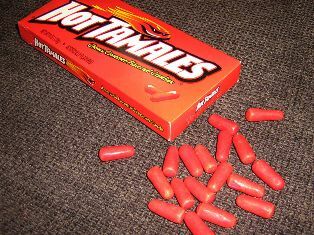 Ohhh how I LOVE candy, especially Hot Tamales!!! Nice hot and spicy post Corinne! I’m glad I got your mouth watering, Harleena – I did it to myself too! 😉 I remember that lovely stuffed red chilli pickle that we used to have in Allahabad. Now, you’ve got me craving for some! I’m sure you get it in Rajasthan too.